Stand-alone street lighting | Atmosfera™. Альтернативные источники энергии. Солнце. Ветер. Вода. Земля. The street lighting is necessary not only in the city, where the energy infrastructure is well developed but there, where it is necessary to run many kilometers to the nearest connection to the central power grid. Not only streets but remote parking lots, parks for agricultural machines, problematic sites of motorways, territories for recreation purpose (parks, beaches), etc. need the lighting. The cost for 1 kilometer of power transmission line for needs of lighting in average is UAH 100 thousands. 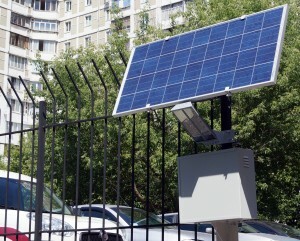 The connection of a simple lamp-post to the power grid in the settlements is technically less complex task but it is associated with the necessity to receive the permitting documentation – not simple and long process. 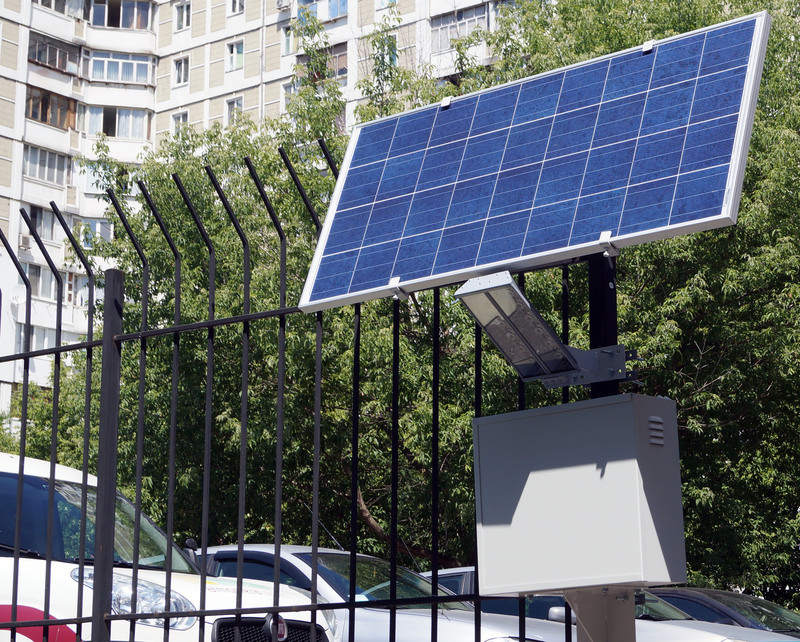 The optimal solution for street lighting organization is often the use of stand-alone lamps that use the solar energy. Their installation does not require either connection to the power grid, or execution of permits. You yourself choose the necessary place and just assemble the solar lamp to any suitable support – a pole, wall of building, fence or even a tree! Atmosfera presents the modular stand-alone lamp that uses the solar energy with possibility for installation to any vertical support. 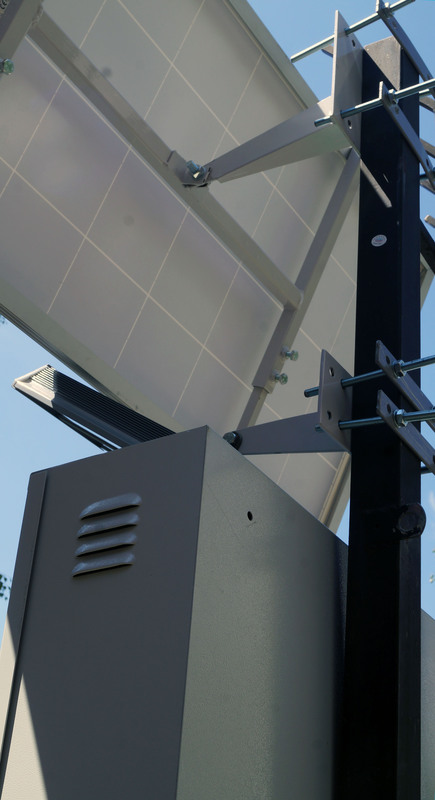 The solar street lamp “Atmosfera” – is a ready-for-use solution, which includes the LED lamp, PV module, accumulator battery, charge controller, as well as a system of fixtures and storage of equipment for assembly practically to any support. The lantern consists of LED lamp with capacity of 28 W, 140 W photo module, 12 V accumulator with capacity of 55 A h, charge controller, as well as a system of fixtures and storage of equipment for assembly practically to any pole or wall. 12 LEDs with the total capacity of 28 V, equipped with special optics, provide with the light flux of 3,200 lm. The optimal height for installation of lamp is 4-6 meters. Thanks to individual fixture a lamp may be directed to any side and lifted to any height to achieve the desired lit area. The stand-alone solar plant, consisting of 140 W PV module, accumulator and charge controller, provides with the power supply of LED lamp. 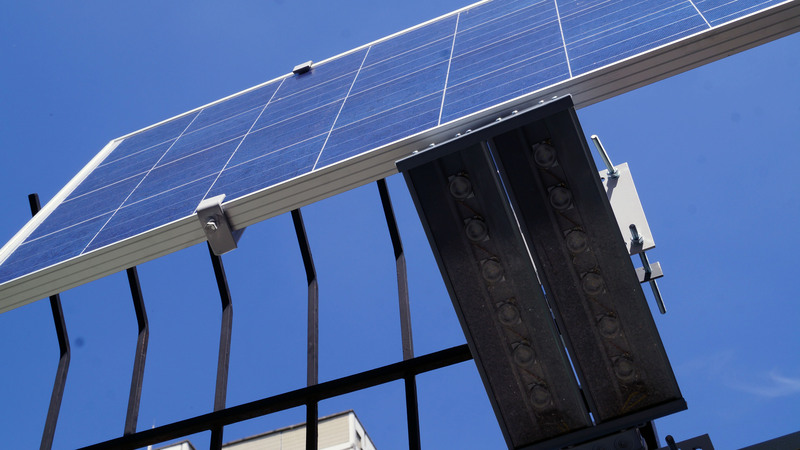 The individual fixture allows achieving the maximum efficiency of photo module – orienting it maximally to the south and without problems changing the angle of slope depending on the season of the year. Operation in certain intervals of time – shutdown in some hours after sunset and activation during some hours before sunrise. The battery and controller are kept in firm, vandal-proof box, made of 2 mm steel and equipped with warded lock. 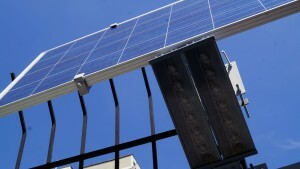 The box also has the individual fixture to the support, so, it can be installed at any height or inside the building. Where can you buy a solar lamp for stand-alone street lighting?